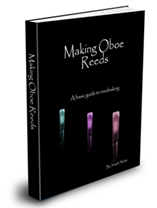 Well, you might think that all there is to crowing an oboe reed is to put it in your mouth and blow hard. In essence that is correct, but did you know that 99% of the information you need to make a good reed is in the crow? The answer to the first part is simple. 2 octave “C’s”. No other pitches or noises. Some people prefer 3 octave “C’s”. The main point is that the crow is clean and not flat. For me, there are two crow tests that I find useful. The first one is to put the oboe reed in my mouth past the thread, and blow very lightly. You should hear the first octave “C” come in. When you do, increase your air a bit and let the second octave come in. Blow a bit more, and maybe a third octave will sound. If you hear any other noises or pitches sounding, you must adjust the reed. Always start by making sure the crow is up to pitch. One other way to see if the pitch crow is fine, is to put the reed in your mouth in a playing position. Tongue the reed and listen for the crow. If the reed is flat, this crow will be lower than a “C”. Clip the reed until the crow reaches C in this position. If the reed is a bit hard afterward, adjust it. Be aware that this might raise the thread crow to around a “C#”. Not a big problem. Many of my best reeds crow that. Learn to listen to the crow for your information. Your reeds will improve dramatically.